BOSTON, MA--(Marketwired - Jul 10, 2014) - New England is the quintessential summer destination, offering everything from historic landmarks to delicious seafood. At the Boston Marriott Copley Place, visitors can get a taste of the region in one of its most popular cities for a great deal. With the Perfect Summer in New England downtown Boston hotel deal, visitors enjoy rates as low as $199 and the advantage of staying in the heart of the historic city. 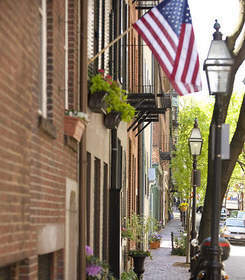 The hotel's Back Bay neighborhood is filled with chic boutiques, trendy restaurants, architectural treasures and charming houses, which line popular Newbury Street, Boylston Street and Commonwealth Avenue. Visitors will also find the city's two tallest buildings, the Prudential Center and John Hancock Tower. The Prudential Center is also home to The Shops, just one of the two malls connected to this lodging in downtown Boston. The Shops are home to stores including Sephora, Saks Fifth Avenue and Lord & Taylor, plus popular restaurants such as 5 Napkin Burger. The hotel's other retail neighbor, Copley Place, offers 75 high-end shops, from Barneys New York, Salvatore Ferragamo and Louis Vuitton to Christian Dior, Burberry and Neiman Marcus. While the area near this hotel is certainly appealing for shopping and history buffs, it's also the perfect place for sports fans, no matter what their game. Baseball fans can cheer on the Red Sox at Fenway Park, and while TD Garden is usually home to the NBA's Celtics, it hosts big-name musical acts in the summer, with everyone from Bruno Mars to Katy Perry slated to take the stage. Fans who prefer to avoid the crowds and watch their favorite sport on the big screen can relax with a burger and a beer at the hotel's Champions sports bar. Families looking for a fun, easy way to explore the city can hop onto a Trolley Tour or the multi-terrain Duck Tours, located just outside this hotel in Copley Square. In the evening, catch a performance from the Boston Symphony Orchestra and Boston Pops at Symphony Hall, or head down to the hotel's Connexion Lounge, featuring lounge seating, wines by the glass, bar fare favorites and Wi-Fi. To book the Perfect Summer in New England Package, visit www.marriott.com/hotels/hotel-deals/bosco-boston-marriott-copley-place/, or call 1-800-228-9290 in the U.S. Rates start as low as $199 a night and are available through September 30, 2014. With more than 500 hotels and resorts in nearly 60 countries around the world, Marriott Hotels is evolving travel through every aspect of the guest's stay enabling the next generation to Travel Brilliantly. Boldly transforming the brand for mobile and global travelers who blend work and play, Marriott leads the industry with innovations including the Greatroom, Future of Meetings and Mobile Guest Services that elevates style & design and technology. All Marriott hotels participate in the award winning Marriott Rewards frequent travel program that allows members to earn hotel points or airline miles for every dollar spent during each stay. For more information, visit www.MarriottHotels.com. To join the ongoing Marriott conversation, like us on Facebook (Facebook.com/Marriott) and follow us on Twitter (Twitter.com/Marriott, @Marriott). Guests can take advantage of the Perfect Summer in New England package and enjoy all that downtown Boston has to offer at a discounted price.